We’re leaving Lisbon today. I can’t help feeling a little saddened by that as we’ve loved this city. It has that magical blend of very old and new and is a terrific place for just wandering around which we enjoy. We’ve enjoyed the food – a lot of fish – and the people, who seem genuinely concerned that tourists will like their city. On two occasions we’ve had elderly people coming up to us to warn us to be more vigilant in looking after Liora’s purse. They’ve made a real effort and we can’t help but be impressed. Hertz brings us our hire car which thankfully is very small. A compact size Fiat. We ask them to lead us to the road going out of Lisbon which they agree to, although not with enthusiasm. Just getting out of the Castelo area is nerve-wracking; the roads were built by the Moors and definitely not for cars. They’re very narrow and there are people everywhere. But we get down and then I lose my navigator car but somehow, after a few very nervy moments, we get on the right road out of Lisbon. We’re shocked a few minutes later when a cellphone rings. Ours is off so it’s doubly surprising. Turns out the Hertz guy left his phone in the car. In tortured English, he explains that he’d like us to bring it quickly to the airport for him to collect. As far as I’m concerned he’s out of his mind – I’ve just sweated to find my way out of a city notorious for its difficult driving and now he wants me to find my way to the airport ? I carry on, he calls a few more times and then gives up. This goes on for a few days until his battery runs out (we try switch off the phone but discover we are cellphone technologically challenged and fail). We head north, passing Leiria where we get a glance at the brand new soccer stadium built for the 2004 European soccer championships. These are little travel tidbits I enjoy although Liora does not always appreciate them as much. We reach Praia Velha where we walk around and spend time at the beach. It’s a big, wide beach and it’s packed with Portuguese holidaymakers; the town itself is a cute, compact one with a tiny pedestrianized section in the middle. The Atlantic waves are bigger than anything I’ve ever seen, but there are masses of people in the sea so I go in too and it’s fabulous. After Liora’s gone for a swim as well, we have a quick lunch (tuna sandwiches, which fast becomes a staple of ours) and head on. 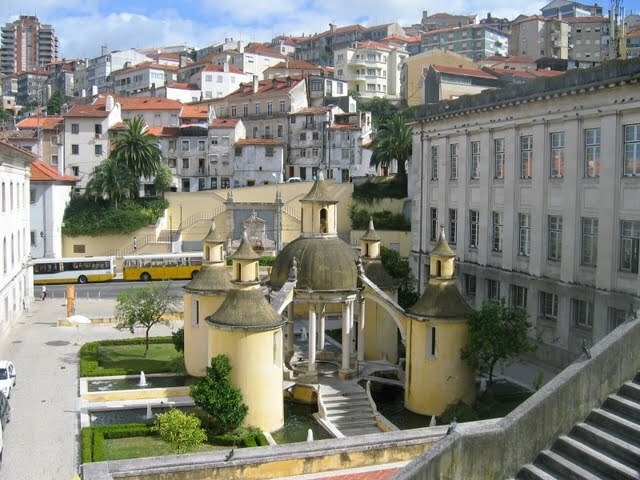 We’re headed for Coimbra which we reach by late afternoon. We’re staying at the Hotel Astoria, perfectly placed by the river, but without parking. I struggle a bit and then look for a spot in a lot nearby while Liora goes to check in. It’s a bit overwhelming and I can’t find anything so when a semi official looking chap tells me he’ll help, it doesn’t sound too bad. He shows me where to park and asks for a few Euros to put in the central meter. It’s only when the hotel tells me parking is free at that time till the morning and not to pay anyone that I realize I’ve been duped. It’s not a lot of money, but I feel pretty stupid (and should). We walk around this old city and take in the university, built in 1290. The town has a wonderful Portuguese blend of old and new, with souvenir, fast food and regular shops adorning very old streets. It’s very pleasant, made more so when we find an atmospheric alley filled with restaurants and choose one. Having travelled for years with our children, it’s quite refreshing to eat in a restaurant we think we’ll like as opposed to one they’ll tolerate. Next morning, after an excellent breakfast, we walk around some more. Coimbra really is lovely, and strangely it’s nicer in the morning, with all the hustle and bustle of a weekday morning, than it was yesterday evening. It’s busy but all within old walls and buildings. And the hotel is well located – especially with the car still so securely parked – right besides a long pedestrianized shopping street. We have to leave though for we have big plans. We’re driving towards the Mountain Beiras, to Belmonte and then Sierra de Estrella. It soon becomes clear that we have several route options but we can’t settle on any. We get lost a few times and the trip takes far too long. It’s mid afternoon when we reach Belmonte. The town is a little obscure (half a page in Rough Guide) but we’re very interested to see it because of its Jewish connection. Apparently it has one of the country’s largest Jewish communities. During the Inquisition, they mostly converted or fled, but remained Jewish in secret. Somehow this continued until the 1974 revolution when at last the people felt comfortable enough to ‘out’ themselves or their religion. Considering this is a very small village, that’s quite a story. The town is quaint and very pleasant. We park somewhere and go searching for the new synagogue, built in the 1990’s. It’s not easy to find but when we get there we are rewarded with a spanking new building with great views of the surrounding hills. From there we go to the Jewish museum, a real oddity in a town so small. It basically is there to teach people what Jews are, in case everyone forgot after the Jews were removed from the Iberian peninsula. It’s well kept and not bad and we spend a bit of time there, before giving in to hunger and have tuna sandwiches at a cafe nearby. 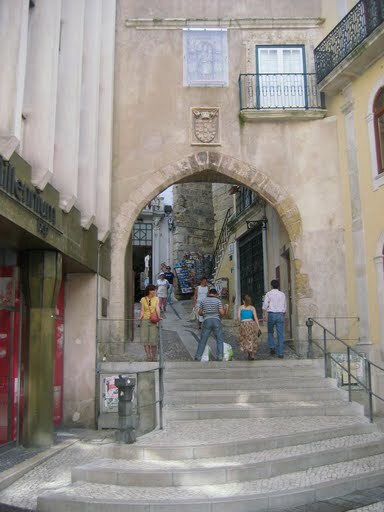 Across from the synagogue is the castle, where one of Portugal’s most famous (or infamous) explorers, Pedro Cabral was born. He is often cedited with ‘discovering’ Brazil (for Portugal anyway) and then for carrying out all sorts of atrocities common to European discoverers of the time. His tomb is just below the walls. He may have a checkered history, but the castle is terrific. We go back to the car and it won’t start. It’s quite a shock, but there’s nothing I can do. Worse, while the level of English in Portugal has generally been high, here we can’t find an English speaker at all. We’re well and truly stuck. We’re staying the next two nights at a Pousada high in the mountains; it’s not only our smartest accommodations of the whole trip, it’s ironically the only one we’ve prepaid and now it seems we have no way to get there. A taxi driver lends us his cellphone but we have no idea what to do; eventually he talks to Hertz for us. There seems to be a question of whether the car was already damaged or whether we (me, as the driver) destroyed it. After he takes me to an auto shop, though, it is confirmed that this car will not be driven for a while. The whole saga takes a few hours. The company sends a very surly and irritated driver to take us to our pousada – it appears we are interfering with his dinner plans. The drive up the mountain is breathtaking and hair raising – we have been warned the drive up the mountain is incredibly scary – and I’m glad I’m not doing it myself. The following evening, another driver will pick us up in town and take us to get a new car. So we have little choice but to relax and enjoy ourselves. Our hotel, Pousada de Sao Lourenco, is magnificently located up the mountain, with nothing around. We eat in the very expensive but ultimately disappointing restaurant before retiring to our beautiful room. It’s been quite a day.